Dacryocystorhinostomy (DCR) surgery is a procedure that aims to eliminate fluid and mucus retention within the lacrimal sac, and to increase tear drainage for relief of epiphora (water running down the face). A DCR procedure involves removal of bone adjacent to the nasolacrimal sac and incorporating the lacrimal sac with the lateral nasal mucosa in order to bypass the nasolacrimal duct obstruction. This allows tears to drain directly into the nasal cavity from the canaliculi via a new low-resistance pathway. Nasolacrimal duct obstruction (NLDO) can result in a watery eye, due to obstruction of the outflow of tears. Nasolacrimal duct obstruction, occurs as a congenital or acquired disease. Acquired causes can be numerous. The obstruction of the nasolacrimal excretory system may occur in the proximal puncta, canaliculi, common canaliculus, or more distally within the lacrimal sac or nasolacrimal duct. Anatomic dissection of the lacrimal drainage system including the puncta, canaliculi, lacrimal sac, and duct. Acquired NLDO may develop for a variety of reasons, including secondary to facial trauma, chronic environmental allergies, toxicity from chemotherapeutic drugs or topical medications, neoplasms, long-standing sinus disease, or following sinonasal surgery. A detailed history is crucial to distinguishing NLDO as the cause of tearing, as opposed to reflexive tearing from other causes. A complete patient history should include assessment of symptoms, daily functional status, pertinent medical conditions, medications used (including sinus decongestants and nasal sprays, topical eye drops such as phospholine iodide), and other risk factors (e.g. facial or nasal trauma, sinus disease, environmental allergies, systemic chemotherapeutic drugs such as taxotere, history of sinus or nasal surgery, periorbital radiation). The clinical diagnosis of nasolacrimal duct obstruction requiring DCR is made by the patient history, in conjunction with an elevated tear meniscus and demonstration of lacrimal outflow obstruction on probing and irrigation. A delayed dye disappearance test can be a good indicatory of lacrimal obstruction in the pediatric population. Elevated tear meniscus using slit-lamp biomicroscopy. Probing and irrigation: Gold standard of nasolacrimal outflow testing. A drop of topical anesthetic is placed on the ocular surface, and a punctal dilator is used to dilate the punctum. A 0-0 Bowman probe can be used to assess the canaliculus for any diffuse stenosis or focal strictures. If present, the distance of the stricture from the punctum is recorded to determine if a conjunctivodacrycystorhinostomy (CDCR) is indicated. A 21 or 23 gauge lacrimal cannula on a 3cc syringe is advanced through each canaliculus, and saline is injected. Reflux of saline through the same canaliculus indicates obstruction of the canaliculus, whereas reflux from the opposite punctum indicates obstruction in the nasolacrimal sac or duct. Passage of saline into the nose and throat with ease and no reflux signifies an anatomically patent nasolacrimal excretory system. A partial obstruction can also exist if there is some flow into the nose but with increased resistance to irrigation and/or some degree of reflux. DCG: A contract dye is injected actively into the punctum and canaliculus during simultaneous CT or MRI imaging to determine if an anatomic obstruction exists within the outflow system, and where the obstruction occurs. Excellent anatomic detail can be achieved. DSG: A radioactive agent, technetium-99m pertechnetate or technetium-99m-labeled sulfur colloid, is placed on the ocular surface. The patient is seated and immediately imaged using a gamma camera to take rapid pictures of the lacrimal outflow system as the tracer flows passively through the lacrimal pump system. The canaliculi and sac should be visualized within 10-12 seconds following injection, with passage into the nasal cavity occurring within 10-30 minutes. The disadvantages of DSG include the low resolution and lack of anatomic detail. Initial treatment of NLDO includes determining and addressing the cause(s) of tearing, and correcting any eyelid malposition or ocular surface abnormalities contributing to symptoms. Partial NLDO in adults may occasionally be amenable to silicone intubation without DCR or balloon-assisted dacryoplasty. Advantages of the external approach include excellent success rates, reported to be up to 90-95%. A large osteotomy is created with direct visualization of lacrimal sac abnormalities, such as lacrimal stones, foreign bodies, or tumors. Direct suturing of the nasolacrimal sac and lateral nasal mucosal flaps allow for optimal apposition and primary intention healing of the flaps to create the bypass system. 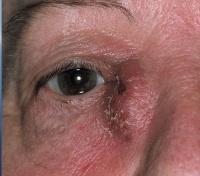 Disadvantages include a visible scar compared to the internal approach. Primary endonasal/endoscopic dacryocystorhinostomy- Advantages of the internal, or endonasal, approach include lack of a skin incision. This can be an option for the pediatric population or in younger patients without skin creases that could camouflage a scar. There is some evidence that endoscopic DCR may be as effective as external DCR, with high success rates. Anesthesia: DCR may be performed under monitored sedation or general anesthesia based on the surgeon and patient’s preference. The patient may typically be discharged home on the same day. Local anesthesia, using an equal mixture of 1-2% lidocaine and 0.5% bupivicaine, with 1:100,000 epinephrine, is infiltrated into the medial canthus, lower lid incision site, and nasal mucosa. Nasal packing soaked in 4% cocaine, lidocaine, or afrin (oxymetazoline) provides additional nasal anesthesia and mucosal vasoconstriction to the middle meatus. Meticulous hemostasis is crucial to a successful DCR surgery. Technique (External DCR): A curvilinear skin incision is made with a surgical marking pen at the level of the medial canthal tendon and extending into the thin skin of the lower lid for approximately 10-12 mm. The patient’s face is prepped and draped in the usual sterile fashion. A lubricated corneal protective lens is often placed on the ocular surface to protect the globe during surgery. The skin is incised with a 15-blade scalpel or monopolar unit with a Colorado needle tip. The orbicularis oculi muscle fibers are separated until the periosteum of the anterior lacrimal crest is identified. The dissection should be lateral to the angular vessels to avoid bleeding. The periosteum along the anterior lacrimal crest is next incised from the level of the medial canthal tendon extending inferiorly, and the periosteum widely elevated with Freer elevators anteriorly off the nasal bone. The periorbita and lacrimal sac are similarly elevated posterolaterally off the lacrimal sac fossa. The fossa is next carefully perforated where the bone thins at the suture line between the thicker frontal process of the maxilla and the adjacent thinner lacrimal bone. Kerrison rongeurs or a high-speed drill are used to remove the bone of the lacrimal fossa, inferiorly to the lacrimal duct at the inferior orbital rim, and anteriorly past the anterior lacrimal crest. A bony ostium measuring approximately 15mm is removed, taking care to avoid a cerebrospinal fluid leak or injuring the underlying nasal mucosa. A 0-0 Bowman probe is passed into the lacrimal sac to tent the sac medially, and Westcott scissors are used to open the lacrimal sac from the duct to the fundus, with relaxing incisions at both ends. Any abnormal scar overlying the opening of the common canaliculus, lacrimal sac stones, foreign bodies, or masses are removed if present. A corresponding incision is made in the nasal mucosa, to create anterior only, or anterior and posterior flaps. Lacrimal sac opened to create a flap. 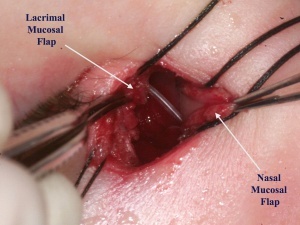 A corresponding nasal mucosal flap is elevated. The lacrimal sac flaps are meticulously anastamosed to the nasal mucosal flaps after silicone tubes are passed into the canaliculi and through the DCR ostium. The silicone tubes are placed through the new ostium and the flaps sutured together. 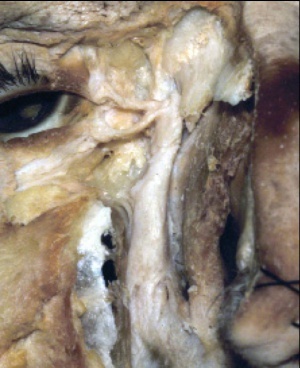 After suturing the flaps together to create the new pathway into the nose, the orbicularis muscle and skin are closed in layered fashion. 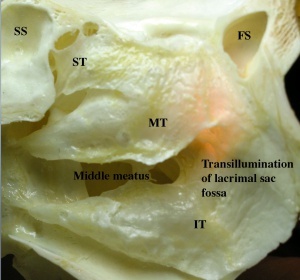 The anterior limb of the medial canthal tendon is also resuspended if released earlier. The silicone tubes are tied and left long in the nasal vestibule to facilitate office removal later. The tubes may be removed anywhere from 4 weeks to several months after surgery. Technique (Endonasal/Endoscopic DCR): The primary benefit of the endonasal, or internal, approach is the lack of skin scarring. The nasal mucosa and middle turbinate are first decongested for vasoconstriction and hemostasis. Using a nasal endoscope for visualization, the lateral nasal mucosa adjacent to the lacrimal sac is then incised vertically and elevated. The sac location is typically located anterior to the anterior aspect of the middle turbinate along the nasal wall. 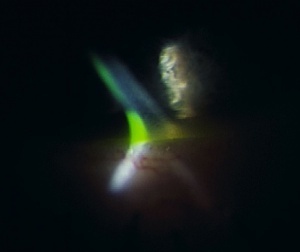 A fiberoptic endoilluminator, as used in vitreoretinal surgery, may be inserted through the canaliculi into the sac in order to help transilluminate the lacrimal bone medial to the lacrimal sac if needed. Location of the lacrimal sac anterior to the middle turbinate using transillumination. Full exposure of the bone adjacent to the lacrimal sac is needed. Wide elevation of the nasal mucosa is performed with Freer elevators, and the mucosa removed with endoscopic forceps. The lacrimal bone is next removed with a high-speed drill, Kerrison rongeurs, or pituitary rongeurs. Lasers have also been used as well. 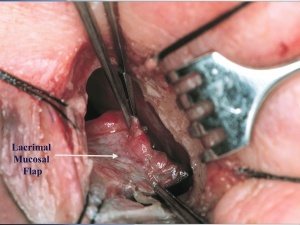 The final bony ostium should be approximately 8mm in height and include adequate clearance of the common canaliculus internal ostium and the inferior sac to avoid persistent accumulation in the inferior sac (lacrimal sump). 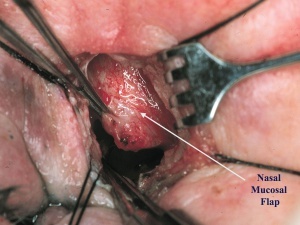 After bone removal, the lacrimal sac mucosa is infiltrated with local anesthetic for vasoconstriction, incised, and the medial sac mucosa removed with forceps. Adequate lacrimal sac mucosal removal is confirmed by free flow of saline or fluorescein from the canaliculi through the nasal ostium, or direct visualization of the common internal punctum with the endoscope. Bicanalicular silicone intubation may also be placed as in the external DCR approach, and removed postoperatively in the office. Mitomycin C, an antimetabolite, may judiciously be applied to the intranasal ostium to modulate fibrosis. Following surgery, the patient is discharged home if stable and instructed to rest for one week, without heavy lifting, exercise, or strenuous activity that may induce bleeding. Hot drinks and food should be avoided for the first 12-24 hours postoperatively in order to decrease the risk of epistaxis caused by heat-induced nasal vasodilation. Ice/cold compresses are placed on the incision site for 48 hours while awake to minimize swelling and bruising. The patient’s head should remain elevated at all times at a 45 degree angle and the patient instructed to avoid nose blowing for one week to decrease the risk of hemorrhage. Skin sutures are removed one week postoperatively if nonabsorbable sutures were used, and the silicone tube is removed typically at 4-8 weeks after surgery. Failure to completely open the inferior portion of the lacrimal sac, resulting in a lacrimal sump syndrome. Prognosis after DCR is excellent, with success rates up to 90-95% for the external approach. Although there has been a wider range of success rates reported with the endonasal DCR technique, some studies have demonstrated success rates comparable to those obtained with external DCR. American Academy of Ophthalmology. Oculoplastics/Orbit: Endonasal dacryocystorhinostomy for acquired nasolacrimal duct obstruction Practicing Ophthalmologists Learning System, 2017 - 2019 San Francisco: American Academy of Ophthalmology, 2017. American Academy of Ophthalmology. Oculoplastics/Orbit: External dacryocystorhinostomy for acquired nasolacrimal duct obstruction Practicing Ophthalmologists Learning System, 2017 - 2019 San Francisco: American Academy of Ophthalmology, 2017. ↑ Hurwitz JJ. The Lacrimal System. Philadelphia: Lippincott-Raven; 1996. ↑ Burkat CN, Lucarelli MJ. Tear meniscus level as an indicator of nasolacrimal obstruction. Ophthalmology. 2005;112:344–348. ↑ Ewing AE. Roentgen ray demonstration of the lacrimal abscess cavity. Am J Ophthalmol. 1909; 24:1. ↑ Rossomondo RM, Carlton WH, Trueblood J, et al. A new method of evaluating lacrimal drainage. Arch Ophthalmol. 1972; 88:523-525. ↑ Wearne MJ, Pitts J, Frank J, et al. Comparison of dacryocystography and lacrimal scintigraphy in the diagnosis of functional nasolacrimal duct obstruction. Br J Ophthalmol. 1999;83:1032–5. ↑ Marcet, Marcus M., Andrew KT Kuk, and Paul O. Phelps. "Evidence-based review of surgical practices in endoscopic endonasal dacryocystorhinostomy for primary acquired nasolacrimal duct obstruction and other new indications. "Current opinion in ophthalmology 25.5 (2014): 443-448. ↑ Massaro BM, Gonnering RS, Harris GJ. Endonasal laser dacryocystorhinostomy: A new approach to nasolacrimal duct obstruction. Arch Ophthalmol. 1990;108:1172-1176. ↑ Gonnering RS, Lyon DB, Fisher JC. Endoscopic laser-assisted lacrimal surgery. Am J Ophthalmol. 1991;111(2)152-157. ↑ Kao SC, Liao CL, Tseng JH, Chen MS, Hou PK. Dacryocystorhinostomy with intraoperative mitomycin C. Ophthalmology. 1997; 104(1):86-91. This page was last modified on February 15, 2019, at 17:41. This page has been accessed 321,083 times.